Counting as we know it, including zero as a number, was brought to the traders and merchants of Europe by Leonardo of Pisa (whom we now know as Fibonacci) by his book "Liber Abbaci" in 1202. This system was already used by academics for mathematics, but was not known to the majority of the population. (ref: "The man of Numbers" by Keith Devlin, ISBN 978-1-4088-2248-7) My question is how did common people here in Britain count before that, for instance the year, day of month, hour of day: how were they counted, if at all? I was seduced by the simplicity of Cominterm's comment/answer, but what happened when they got to "ten", and "eleven" and "twenty" and "one hundred" without knowing about a zero digit? Regarding the "put on hold" this is not a trivial question that can be answered fairly easily -- I spent a lot of time trying to find out before I posted it here, and surely it comes well within "Cultures and historical practices" as listed in "What topics can I ask about here?" I am interested in the evolution from Roman numerals to Indo/Arabic, particularly in how people described dates, especially days of the month. The Liber Abaci is not about counting. Almost all of it are solutions to various algebra problems. The first chapter describes the Arabic numerals. The second shows how to multiply using Arabic numerals and it gets more complicated from there. So, it is not really a book about "counting". 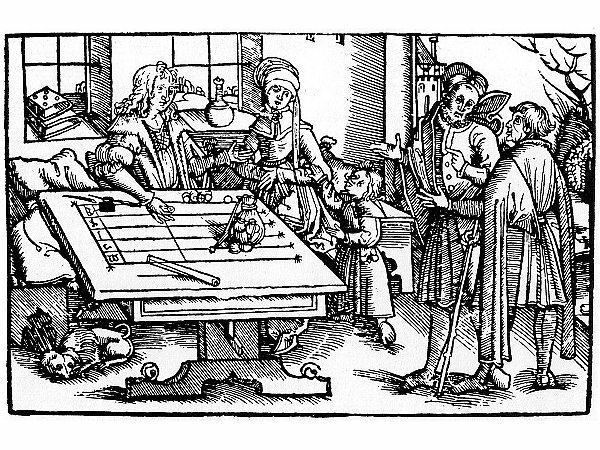 The woodcut above that dates to around 1500 shows a typical counting table. It functioned much like an abacus. The user would draw lines on the table and then arrange pebbles to do calculations. In Latin the word for a pebble is "calculus". This leads to our words such as "calculation" and "calculus". After Fibonacci, some people started to do calculations using Arabic numerals and it became a competing system. In fact, believe it or not there were contests between "algorists" that used Arabic numerals and "calculators" that used the old Roman method using pebbles. This dual system continued well into the 1600s, more than 400 years after the Liber Abaci was written. Most likely they did not know how to count, except for the very basics, such as counting on their fingers and adding up small values. In the middle ages mathematics had a heavy foundation in arithmetic, and therefore the Ph.D. in Mathematics would be roughly equivalent to a third grader's homework today. Since academics and education did not have a emphasis in the middle ages, most people would not have explored number theory (even a most "primitive" case of coming up with zero). The monks, aristocracy and other educated people would have used the clumsy Roman Numeral system. Most common people were illiterate so they did not write down numbers, and did not understand numbers or number systems. Not the answer you're looking for? Browse other questions tagged everyday-life mathematics or ask your own question. Before iron was common, what did common people use for door hinges? How did people say “I have to go to the bathroom” before the bathroom and pipes were common?